Hello everyone! How are you all? Today as a part of the Sunday Street Team I am featuring Danika Stone! The topic is The Challenge of Writing a Mystery. Enjoy her post! I love well-written mysteries, especially those that include unexpected twists and turns along the way. (Tana French has a special place on my bookshelf.) But having an idea and bringing it to fruition are two different things and there are some very specific challenges to the mystery genre. These are the ones that post unique challenges to writing. 1. Your setting is MORE than a setting. Having spent much of my childhood in Waterton, I know the landscape inside and out. It’s gorgeous, but eerily remote. When I started thinking about writing a mystery, it became the obvious location for The Dark Divide. Your mystery setting needs to invoke mood. It needs to provide challenges. (Waterton has dubious cell phone coverage, and there are plenty of areas where even an experienced hiker can be lost.) By considering setting, a writer creates a mood that pervades a novel. 2. You need to trick your readers. One of the things that many other genres DON’T require is a specific plan to confuse and confound your audience. Mystery novels do! To create this, the writer must follow a careful approach to laying out the pieces of the plot. Scene by scene they must dole out enough information to weave a realistic story, all the while providing enough out-of-context clues that lead, like a maze, to dead ends. The best way to do this? Have a good mystery editor to help you on the way. My editor, Dinah Forbes, spent her entire career at McClelland & Stewart, editing (you guessed it) mysteries. She gave me the insights on how to tweak the plot so it was both confusing AND satisfying to readers. 3. You need to spread the blame around. One way to keep your readers guessing is to include enough characters and to make each one of them seem somewhat guilty. This way, the readers don’t know and can’t guess (right away) who the killer is. For me, this complex planning was the biggest difference between writing a mystery and other genres. The Dark Divide has a character list at the beginning so that people who’ve jumped into book 2 (and have not read Edge of Wild) can keep up with all the different people in the story. 4. Your readers have to CARE. The level of tension you must build in a mystery novel is unique to the genre. They must be invested in what happens to the characters, and they need to want to know they’ll be okay. To do this, the plot must unravel at exactly the right pace. You also have to keep the stakes high! One trick to doing this is to list all the terrible things you intend to do to your protagonist, then organize them in order from least troublesome (losing a job) to most serious (death). It keeps your plot moving, too! 5. The plot must move like a well-oiled machine. I’m admittedly better at writing first drafts than at editing. (And that’s why it’s good I’ve worked with excellent editors!) Writing a mystery requires a very careful approach to laying out the pieces of the plot and including enough red herrings to confuse the reader. Each edit requires a recalibrating of ALL the other parts. Where a regular YA novel usually takes me a couple rounds of edits to get “right”, a mystery takes twice that. For me, this complex planning is by far the biggest challenge between writing a mystery and other genres, but I wouldn’t have it any other way! Hello everyone! Today I am participating with the Sunday Street Team and the illustrator Linnea Gear! Below is the guest post. How do you come up with character designs? Do the designs match the character’s personality? Designing characters is my favorite thing to do because you can literally incorporate anything you want. The designs always match the characters personality and that’s what makes it so amazing! It’s why I love drawing people in general, because every person is so different. They can be tall or short, big or thin. Hello everyone! Today I am participating with the Sunday Street Team and Tracey Neithercott to bring you a guest post! Below is the Tracey’s answer to my question. What’s you’re writing process as an author? I’m going to write 5,000 words a day. I’m going to ignore my inner editor. I’m going to do it all with shiny, Pantene-perfect hair. Let’s face it: I never, ever have shiny, Pantene-perfect hair. And my process is much less glamorous. It starts with a lot of staring miserably at a blank screen and gradually progresses to grumblings about the pure pain of writing a first draft. I’ll begin with a disclaimer: I’m not the sort of writer who sees double rainbows and snuggly puppy dogs while drafting. Actually, that’s a lie. I do see those things, but only because I’m procrastinating by scrolling through Tumblr. So I do everything I can to get myself into the writing headspace. I make a latte or three meant to energize me and/or allow me to procrastinate writing for two more minutes. I put on a sheet mask, because if I can’t have bouncy, shampoo-commercial hair, I can at least try for glowing skin. As you can see, much writing is happening. To make it go faster, I’ll turn on my Brainwaves app, plug in my earbuds, and let the sound induce the right Brainwaves for a creative state of mind. This is something I used to roll my eyes at before returning to my hard work of staring at the blank screen. Now, though, I’m pretty convinced it helps me get into the writing mode. I let my brain waves do their syncing thing, pull off the sheet mask, and marvel at my glowy skin. Then I take a sip of latte and start writing. I do a lot of preplanning, mostly because I enjoy outlining but also because I’m a type A writer who needs to be in control. By the time I start writing, I have a roadmap for the story, including major story points—the inciting incident, midpoint, plot points, climax, and so on—plus the main scenes that connect them. When the words really won’t come, I create a scene sketch: major events, character arc, setting, and bits of dialogue. It’s enough direction to get me going. It goes on and on like that for weeks and months and what feels like centuries until, blessedly, I peel off a sheet mask and get to revise. Now I really do see double rainbows and snuggly puppy dogs. I don’t need sheet masks or glowing skin because I am on fire. And people on fire don’t waste time lining up mask eye holes. Instead, I sit down at my computer and make a list of everything wrong with my book. This isn’t hard to do. I’ve been keeping the list in my head since page one. And that’s how it goes: Working from biggest changes to sentence-level edits, I move through the manuscript until it’s polished. This is fueled by lattes, yes, but also decaf green tea because it’s less expensive and also more practical for nighttime writing. Hello everyone! How are you all doing? 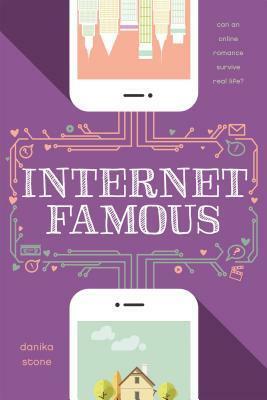 Today I am participating in the Sunday Street Team to promote Danika’s lastest book Internet Famous. Below is the guest post, info about the book, and some info about the author! High school senior and internet sensation Madison Nakama seems to have it all: a happy family, good grades, and a massive online following for her pop-culture blog. But when her mother suddenly abandons the family, Madi finds herself struggling to keep up with all of her commitments. Fandom to the rescue! As her online fans band together to help, an online/offline flirtation sparks with Laurent, a French exchange student. Their internet romance—played out in the comments section of her MadLibs blog—attracts the attention of an internet troll who threatens the separation of Madi’s real and online personas. With her carefully constructed life unraveling, Madi must uncover the hacker’s identity before he can do any more damage, or risk losing the people she loves the most… Laurent included. Danika Stone is an author, artist, and educator who discovered a passion for writing fiction while in the throes of her Masters thesis. A self-declared bibliophile, Danika now writes novels for both teens (All the Feels and Internet Famous) adults (Edge of Wild and Intaglio). When not writing, Danika can be found hiking in the Rockies, planning grand adventures, and spending far too much time online. She lives with her husband, three sons, and a houseful of imaginary characters in a windy corner of Alberta, Canada. Ms. Stone is represented by Morty Mint of Mint Literary Agency. Hello everyone! Today is a very special day because Danika Stone author of Edge of Wild (May 2016) and All the Feels (June 2016) is featuring a guest post for the Sunday Street Team on my blog! Without further ado the guest post! There are many ways to plot a book. For some authors, the process is like gardening: Plant the seeds of an idea, tend them, and see what grows. For others, it’s architecture: Create a structure and assemble the plot by following that plan. I’m probably a little of both, but when it came to writing my mystery / thriller Edge of Wild (Stonehouse, 2016), I found I needed far more of a plan than I’d expected. Looking back, these are some key elements which kept my plot rolling. 1.Start with the End in Mind: Edge of Wild is a small town mystery about an outsider who finds himself in the crosshairs of a killer. Having this main idea from the get-go let my inner ‘gardener’ write what she wanted while maintaining an overall plan. A few unexpected scenes appeared as I wrote, but having this general idea kept them on topic. 2. Lay Out a Plot Plan: In my den, I have a wall dedicated to whatever novel I’m currently working on. I write a one-sentence summary of each scene on a sticky note, color-coding by which character it focuses on. I then lay these scenes out in columns by chapter. These scenes can (and do!) move around while I’m writing, but being able to see them in motion – color by color – lets me get the bigger picture of whose story is being told. With mysteries, it’s important to keep your readers guessing. Moving character-scenes lets you do that. 3. Get An Outside Point-Of-View (or MANY): When the first draft of Edge of Wild was finished, I sent it off to beta-readers. Their insights allowed me to do my first round of edits (and they were massive!) With this done, my agent took a look, offering his ideas for polishing. (Round 2 was slightly easier.) Then the book headed off to a professional editor. In my case, this was Dinah Forbes, one-time executive editor from McClelland & Stewart. She took Edge of Wild to the next level. Her complex, scene-by-scene analysis broke the plot down like a mathematical formula, pointing out issues with pace and plotting, and suggesting ways of tightening the mystery. Her notes were both terrifying and satisfying to read. If someone with a background as strong as Ms. Forbes says your book is ready to sell, it is! 5. Let Your Characters Have One Out-Of-Character Moment: The last hint came to me as I was deep in the throes of revisions, and that is the question of how you throw enough shade on everyone in your story to leave them open to being the potential villain. It’s actually incredibly easy, and works beautifully in the realm of building believable, flawed personas for all the characters in your book. You let them have flaws. And every once in a while, you (sparingly) allow them to do something ever-so-slightly ‘off’. Why? Because your readers are smart, and they’ll be watching for it. You want them to wonder, and there’s no better way to do that then leave everyone as a possible suspect. In the end, you’ll be able to judge your success by your reader’s reactions. I’d say that’s pretty fair evidence that Edge of Wild’s plot works. It was lovely having Danika on my blog! Be sure to check out my review for Edge of Wild tomorrow!